Experienced racing champions of different classes spoke about the different Ducati bikes in the market today. 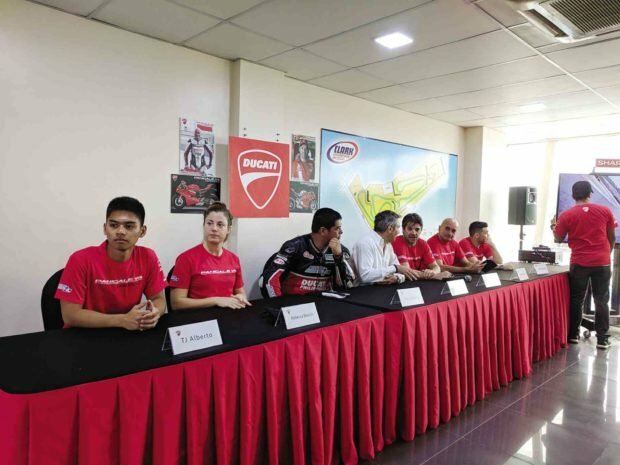 The most telling thing that happened during the days that Ducati Philippines was running a series of track days and rides was not technology—or speed, or passion, or design. It was, to me, a comment made by world champion motorcycle racer Carlos Checa just before going out on the track. He said to be careful. He talked about standing water on the track, and he asked other fellow racers who knew more about the Clark International Speedway track (like TJ Alberto) if there were particular areas. This reminded me that when Ducati Philippines and Access Plus (of Toti Alberto) invite you to ride with them, it is really “with” them. On hand were several experienced world racing champions of different classes, as well as friends and family from the motorcycle and enthusiast industry. And that is the feel you get from their events. As polished and professional as they are (and Toti and Access Plus were recently declared top importer in South East Asia by Ducati in Milan), the feeling is far more about community than you may expect from something that can be as solitary as riding a motorcycle. Panigale bikes always look beautiful, but they require control and nuance when bringing around the track. The key event for the day was the ride with the champions and the chance to test the newest ride in the stable. The champions included the aforementioned and extremely friendly Carlos Checa, World-SBK World Champion, ex MotoGP rider, and ex Ducati official team rider, but also others from a surprisingly wide range. Rebecca Bianchi is Women’s European Supersport Champion and ex WorldSBK STK600 rider, and was warm, friendly, and helpful as she rushed to someone who had a little trouble keeping his bike upright. TJ Alberto is a WorldSBK Superstock 1000 rider and Philippine Superbike race winner and junior class champion. Federico Sandi is a former 125GP, 250G, WorldSBK rider and Superstock 1000 race winner. The Ducati Panigale V45 has more power with its new engine, but is handled better with improved sport safety systems. The always-helpful people from Ducati Philippines were on hand as well. And the bike. The new Ducati Panigale V4S doesn’t even look like it was meant to be seen standing up straight. This engine configuration was developed, according to many enthusiasts, because of Ducati’s dominance with their other motor formats. The bike was on display on a slanted stand on the track, showing the sleek functional design. Always Italian, things have to look wonderful, as well as be insanely good. 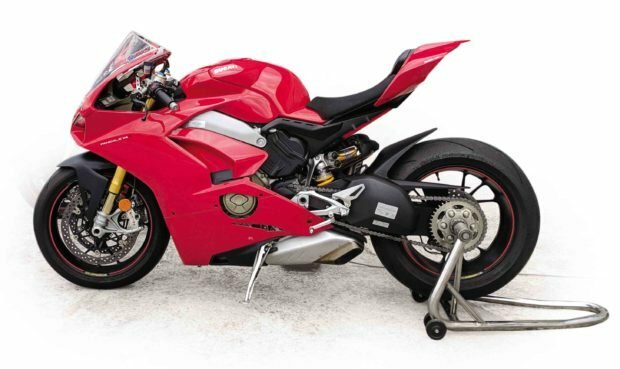 Past Panigale models were always beautiful and svelte, but they required a pretty good amount of power, control and nuance to be able to bring the beasts quickly around a track. The new model has even more power, but it is matched with an aluminum twin-spar frame that cradles the new 1103 cc twin-pulse V4 engine. Riders eagerly wait for their turn to test the bikes. The power and the glory are all tempered by improved rider-aid systems. There is, of course, anti-lock braking and traction control, but you also have things like wheelie control (rather important with this much motor), and slide control (hugely fun if you are able to handle it). Many consider the Panigale V4 S to be the current ultimate superbike. But what is different in the modern world is that the power and precision is more accessible—and honestly more safe. Power comes on more smoothly in the new engine, and it is handled better with the improved sport safety systems. This bike will allow more people to enjoy more time in the saddle, and more safely hone their skills.